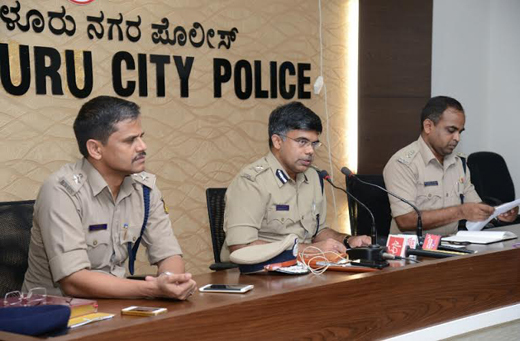 Mangaluru, Mar 21, 2016: Two persons have been arrested in connection to a murder which took place on February 29 in the central market here. The arrested are Ravi alias Ravindra Salian (35) from Pumpwell and Naveen (20) from Davangere. It may be recalled that on 29th February body of an unknown person was found near central market. In this regard a case was registered in North police station. The deceased was been identified as Jayananda (50) from Moodshede. According to M Chandrashekar, Police Commissioner, the duo started a quarrel with Jayanada under the influence of alcohol and ended with the murder. The above detection was done by Shantharam, Police Inspector, North Police Station, staffs Sujan Shetty, Rajesh Alva, Govardhan under the direction of Shantharaju, DCP, Dr. Sanjeeva Patil, DCP and ACP Tilakchandra. The efforts of Shantharam, Police Inspector, North Police Station and his team in solving the case has been appreciated and rewarded by commissioner. The criminals held in murder cases have o get a stern punishment? No bail has to be provided , action has to be taken o the lawyer in case of for fighting for injustice.